Elizabeth LaBau. The Spruce Eats, 2015. 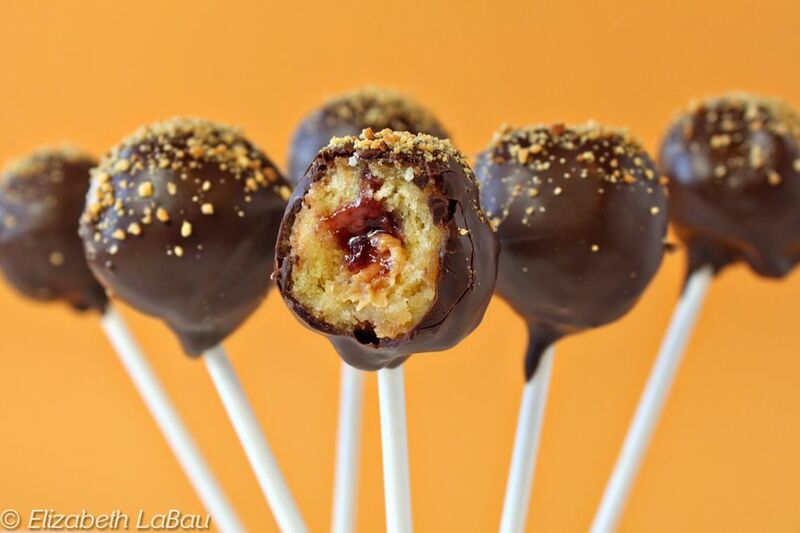 Peanut Butter and Jelly Pops are easy cake pops with a surprise inside—it's peanut butter and jelly! This recipe uses doughnut holes instead of cake balls, so it comes together in a snap. You can change up this recipe by using different fillings like Nutella or frosting instead of the peanut butter and jelly. Insert your round tips into your pastry bags. Fill one bag with the jam and the other bag with the smooth peanut butter. Take a lollipop stick and insert it halfway into a doughnut hole. Poke it around the center, trying to widen a space in the middle of the hole where the jam and peanut butter will be. Don't poke it through the doughnut; try to wiggle it to make more room. Repeat until you've poked holes in all of the doughnuts. Take the bag with the jam and insert the tip into one of the doughnut holes. Squeeze for a second or two, enough to deposit some jam in the center without having it squirt out of the hole in the bottom. Next, take the bag with the peanut butter and insert the tip at a slight angle off from where you inserted the jam tip—you don’t want to be squirting the peanut butter right where the jam went, because then the jam will leak out. Squeeze the bag to deposit some peanut butter in the center of the doughnut. Repeat until all of the doughnuts have peanut butter and jelly in the middle. If any of the fillings leak out, wipe the outside of the doughnuts clean. Melt the chocolate candy coating until it is liquid and smooth. Dip one end of a lollipop stick in the coating, then press it into a doughnut hole on the opposite end of where you inserted your pastry tips. The coating will help hold the stick into the doughnut hole. Skewer the rest of the doughnut holes in the same way. Once all of the pops have sticks attached, take a pop and dip the doughnut hole entirely in the melted coating. Remove it from the chocolate and let the excess drip back in the bowl. While the coating is still wet, sprinkle a pinch of crushed peanuts on top. You can either let the pops dry upright by pushing the sticks into a Styrofoam base, or by laying them on their sides on a baking sheet. Once you've dipped all the pops, let the coating cool completely. Store the peanut butter and jelly pops in an airtight container at room temperature for up to a week.